The strange tale of a woman in a tree, some nice smooth tarmac and how ‘fairy lights are a picture’. In the continuing tale of Sheffield’s street trees, last week saw a new turn of events on Abbeydale Park Rise – the Dore street famed for its Christmas illuminations and Spring cherry blossom. This week’s story from the street is a farcical one of fairy lights, a bumpy pavement made smooth and a very determined woman in a tree. When felling crews arrived the week before last, Jane Sharpe climbed a ladder from her garden into the overhanging branches of a cherry tree in the verge outside her house. She berated them from on high about her belief that the tree was being felled for spurious reasons and made clear that Amey did not have her permission to work on the tree in the airspace above her garden. Branches were hacked on one side, but the tree still stands – thanks to Jane in her perch. Last Wednesday, she took Amey to the small claims court for the destruction of her Christmas lights in the tree last June, during an attempted felling. The cabling had been cut. the lights thrown into her front garden. Amey and the City Council had declared that the tree was severely damaging the path and must be felled so that the path could be repaired. (This was despite Amey’s own tarmac crew carrying out remedial work on the pavement beside the tree opposite Jane’s house last year. This successfully made that pavement perfectly flat too. That tree was still subsequently felled.) A report by residents last year claimed that many of the 19 trees could be retained if tarmac crews were allowed to exercise their skills and judgement. Here is a video showing the BT work – with the roots of the tree 8 inches below the pavement surface. On 5th and 9th March, 60 security men, police and felling crews turned up to fell Jane’s tree and others. The following week, 3 BT men made the pavement flat and proved that the tree could be saved. BT workers had done in a morning that which Amey had claimed was impossible. “I find that fairy lights are a picture”. They could thus be legally cut and removed. Meanwhile, every day, a rota of residents are on look-out from the early hours for felling crews, security personnel and police arriving. Despite their efforts to negotiate, persuade, defend their trees (actually paid for by residents 40 years ago) and even in Jane’s case climb ladders, the famous trees are still set to go. 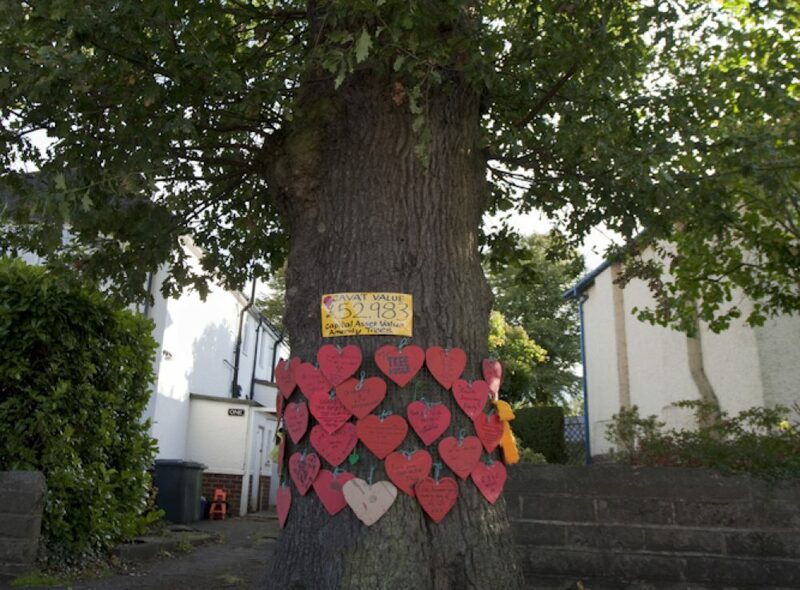 The Council have so far refused to negotiate with the street tree campaign. Residents of Abbeydale Park Rise now wish to challenge Amey once more with this new evidence – that pavements can definitely be repaired without the need for trees to be felled. This must be the case for trees not only here, but across the city. Is felling really “a last resort” Councillor Lodge? Police vans on Abbeydale Road on the way to Abbeydale Park Rise. At the same time, only a handful of residents were on the road. Later, campaigners from elsewhere joined them. This entry was posted in Uncategorized by Sally Goldsmith. Bookmark the permalink. Last resort Councillor Lodge not from where Sheffield residents are standing. I was there to support Jane & residents of Abbeydale Park Rise and this unnecessary butchering of a beautiful tree (s) in spring, during the summer and during Christmas period to raise money for St Luke’s hospice is ridiculous as BT manage lay pavements to a higher standard than Amey without felling trees so maybe they should undertake their training course! Good report Sally, thanks. If BT can do it….. Extraordinary for District Judge Heppell to say …“I find that fairy lights are a picture”.